World Ozone Day will Coming on Every Year 16 Saptember 2012. The World Ozone Day is a Very Important Programe. 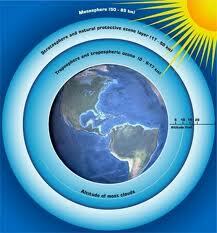 This Daymarks the importance of Ozone layer and its role in the environment. The United nations General Assembly has designated this Day to reflect the adoption of MontrealProtocol on substances that deplete the Ozone layer. The Ozone Layer describes the protective layer of naturally occurring gas, comprised of three atoms of oxygen found about 10 – 50 km above the earth's surface that protects us from the harmful ultraviolet radiation or UV-B rays of sun. Scientist in the 1970’s discovered that the layer was thinning as a result of the release of CFC’s, consequently, the Ozone Hole developed. In 1985, nations around the world convened at Vienna in an attempt to develop a framework for co-operative activities to protect the Ozone layer. This signed agreement became known as the Vienna Convention for the Protection of the Ozone Layer. The UNEP is monitoring compliance with the programmes of the international treaties aimed at eliminating the production and use of ozone-depleting substances, including chlorofluorocarbons (CFCs), used as industrial refrigerants and in aerosols, and the pesticide methyl bromide. Specifically, developing countries need to focus on eliminating the use of methyl bromide as an agricultural pesticide and they must halt illegal trade in CFCs. More than 130,000 new cases of melanoma are reported around the world and some 66,000 people die from skin cancer every year. All That Is A Part Of It.